This is the day that I started my website's Christmas section. Reckon it'll take me a little while to set up all that I'd like to set up, and even to figure out what exactly all that is. But the front page is basically set up (though I could probably stand to look for more Christmas links to include). And my Krampus page is set up. Meanwhile, I should try to think of some Christmasy things I've already done this year. Um... today, also, Disney Movie Rewards had a party kind of thing on their website. I was waiting for that for a week or two, but I nearly forgot about it. It wasn't that great, though. There was a free mp3 to download of "We Wish You a Merry Christmas" from the album "Phineas & Ferb Holiday Favorites." Which I think actually works better when watching Phineas & Ferb Christmas Vacation (from 2009) than when just listening to the song by itself. Also there was a video to watch of a Disney fireplace, which is actually a DVD I've considered buying before, but I don't think I'll bother. And I guess some kind of way of getting bonus DMR points by figuring out clues, but I didn't bother with that. Um. I also wanted to say that last Christmas, I received several Christmas CDs off my Amazon wish list, which I still haven't listened to. And this year, for my birthday (in September), I received a couple more Christmas CDs. So I really should try to listen to all of those things this month. If and when I do, I should mention them specifically on this page. And maybe I could mention some holiday specials and episodes I've seen this year. Way back in September there was a Christmas episode of The Awesomes. More recently there were Christmas eps of Big Bang Theory, Black-ish, Castle, Grimm, Odd Squad, and... I guess there was a slightly Christmasy aspect to the latest episode of South Park (but not enough for me to bother putting it on my Christmas eps page). There will probably be more things I see soon, and if so I'll mention them here. As for specials, this year Comedy Central's All-Star Non-Denominational Christmas Special debuted. It wasn't that good, but another new special, How Murray Saved Christmas, was pretty good. Toy Story That Time Forgot was fun, but not very Christmasy. I also watched a couple of classics for the first time in several years: A Charlie Brown Christmas and Rudolph the Red-Nosed Reindeer. The latter was celebrating its 50th anniversary this year. Anyway, I updated my reviews of both those specials. And I watched a new TV movie, Northpole. It aired in November, and I wasn't exactly planning to watch it, but it was sort of on my radar. And my sister records every Hallmark Christmas movie, so one day earlier this week I noticed it on the DVR and checked it out. Oh, and I watched Peter Pan Live on December 4. It isn't Christmasy, of course, but it was vaguely a holiday event, I guess. Of course every year, Neopets has an Advent Calendar with a new animation and prizes for every day of December, so I've been doing that. As always. And awhile ago (I don't remember for sure if it was this month or late November) I ordered a figurine of Tinker Bell using some of my DMR points. Today is St. Lucy's Day (or Santa Lucia), but I don't expect to do anything related to that, this year. However, this morning I've been watching some SciShow episodes on YouTube, including a Winter Quiz Show (which was uploaded Dec. 4; it's annoying that I don't see SciShow episodes mentioned on my facebook feed as often as I'd like). And it had a couple of questions that are related to Christmas. Tonight I watched The Life & Adventures of Santa Claus, a special I hadn't seen in years, but which I just got on DVD this week. So that was fun. I was planning to watch it last night, but didn't get around to it. We got a Christmas tree today. Also, I watched last week's episodes of "Family Guy", "Brooklyn Nine-Nine", "Bob's Burgers", and "The Simpsons" on Hulu. They were all set around Christmas. I didn't like Family Guy's ep, "The 2000-Year-Old Virgin." But I did enjoy the other shows. So, I linked to my Christmas episodes page earlier, but I might as well do so again. That's something I started last year. This year I've been adding links on that page to Amazon Instant Video, for any of the episodes that can be watched there. I've done a bit of that updating over the past few days or whatever, but I did most of the updating today. So it's nice to get that finished. Also today I watched the new special Elf: Buddy's Musical Christmas, which I didn't particularly like, but it wasn't terrible. Watched last week's Christmas episode of "New Girl" on Hulu. It was pretty awesome. Also it occurred to me today to add eps from "The Flintstones" and "The Twilight Zone" to my Christmas eps page, even though I haven't seen either of those things in years. Having them randomly occur to me now makes me wonder just how many other Christmas episodes I've forgotten. Watched last week's episode of "The Flash," which was set at Christmastime. It was pretty cool. Also I started putting together a playlist of Christmas commercials on YouTube, but I didn't have time to finish it. Went Christmas shopping with my sister and dad. I didn't have a lot of money, certainly not enough to buy anyone presents, which always really bugs me. But I'll make up for it someday when I'm rich. However, I did get a few things for myself. I got some BL Lime Cran-Brrr-Rita, which I first saw advertised last year, starting sometime before Thanksgiving, and I looked for it at every store throughout the holiday season, and then throughout all of this year, but I never found any. Which doesn't surprise me, considering where I live. There are lots of things I can't find around here. But I finally fond it today, so I'm happy about that. Also I got a few DVDs that were on sale, two for $5 each and one for $4. There were a few Christmas things I would have liked to get (including a couple of Tinker Bell ornaments), but of course I can't afford everything I'd like, no matter how inexpensive it is. 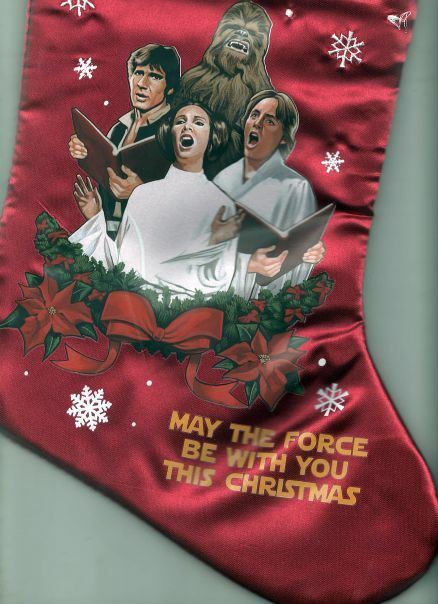 But I did get a Star Wars stocking, which I thought was too awesome to pass up. I couldn't find a pic of it online, and I have no way to take a picture of it myself, so I had to scan it. And of course my scanner's not big enough to get the whole thing, but I got the most important part. Oh, also in the car we listened to a couple of my Christmas CDs. One by Sixpence None the Richer, which I think I got last Christmas, and one by the Muppets, which I got for my birthday this year. I finished making my Christmas commercials playlist. And I watched the short film Treevenge. I watched Babes in Toyland. It's not really a Christmas movie, but Christmas is mentioned in it. And Disney Movie Club (from which I ordered it) always includes it in its Christmas catalog. Started my Christmas Music page. Also, went to Grandma's house for supper. Most of our relatives from Ohio came today, a couple more will be coming tomorrow. Started a page for Christmas music reviews. That is, I moved my list of Christmas CDs off the page where I list all the CDs I own. Most of them I'll have to listen to again someday, so I can write a bit about what I thought of each album. There are a few I listened to recently that I wrote about, though. Not a lot of writing, it's not like I'm reviewing every song on every album, just mentioning the ones that really stuck out for me, for good or bad. And then, I changed the link on the Christmas music page I started yesterday, so instead of going to the old CD page, it goes to the new reviews page. Also, I watched Nestor the Long-Eared Christmas Donkey. 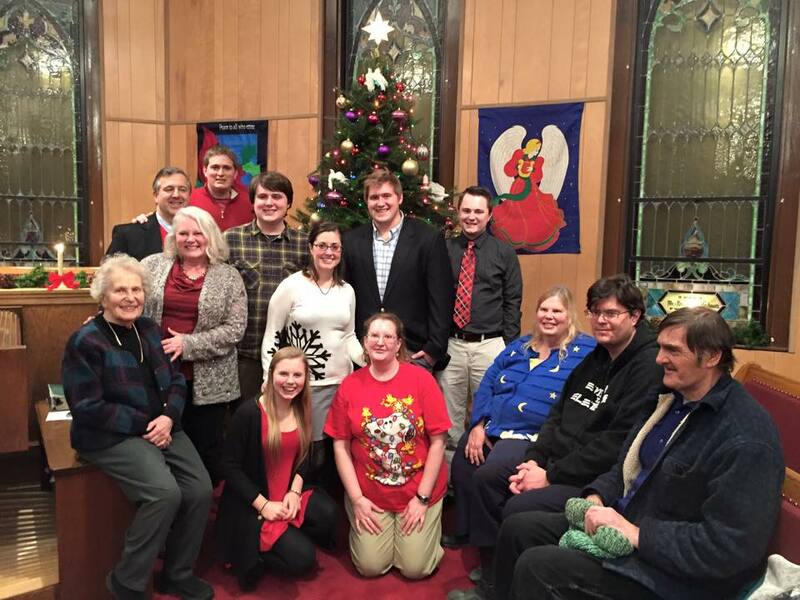 Grandma, Kris, Nancy, Karsten, Matty, Erin, Torry, Luke (standing). Britta and Beth (kneeling). Mom, me, and Dad (sitting). Back at home, I drank my last can of Cran-Brrr-Rita, ate a bit of the Chex party mix that Mom made the other day. (It's remarkable that this is the first time I've eaten any of this batch, because usually I would have had way too much, starting as soon as it's out of the oven.) And I watched the short film Rare Exports Inc. Then I listened to Jackie Evancho's "O Holy Night" CD for the first time, and added my review to the music reviews page I started yesterday. So this was Christmas. And what did I do? Not so much. This morning I tried the Dunkin Donuts apple pie-flavored coffee I had received last night. It wasn't bad. And I had a few things I wanted to do online this morning, before going to the farm. But most of what I wanted to do, I couldn't, because the internet was being too slow. So that triggered my depression. Once I went to the farm, I didn't so much care about the internet anymore, but it was too late, the depression had set in. So I spent almost the whole day lying on a couch, trying to sleep. I didn't get any sleep, and I could hear people in other rooms having fun. But I never joined them. Well, I got up a little while before dinner, after several hours of lying on the couch being depressed. I started playing Pokemon Black, which my cousins had given me their old copy of the other day. But I didn't get far. And I opened a few presents, since I hadn't joined anyone when they were all opening presents. Then there was dinner, which was good, but I didn't eat very much. Then went back to lie on the couch for a few hours. Then went home. There were things I wanted to do tonight at home, but I was still too depressed, so I just lay in bed trying to sleep. And failed. After a few hours of that, I did a bit of internet and played a bit more Pokemon Black. And now my eyes are so heavy. It's been not a great Christmas, but the holiday won't really be over until January 1. So there's still time to get things done and to have fun, I guess. So okay, on Friday (the 26th), my sister and parents and I opened a few more presents. Then my sister and Dad and I went shopping. I bought myself some DVDs, and a fruitcake to share with my cousins, or whoever. Somehow I didn't get around to writing an entry here, that day. Today (the 27th), my sister and I went to the farm. I guess at least some of my cousins tried the fruitcake... their first ever in life, which is crazy. I'm not sure what they thought of it. Also we played a game my dad had given me for Christmas. And we watched a DVD I've had for awhile, Rise of the Guardians. Later some of my cousins and I played Zelda Monopoly. It was a pretty good day, without any serious depression issues. My folks and Grandma and our Ohio kin went to Jade Palace for lunch. And I picked up some Stella Artois. Then my sister and I went to a birthday party for another relation. Then I went to the farm again to visit with my Ohio cousins, where we watched the microseries Star Wars: Clone Wars on DVD. They'd never seen it, and I probably hadn't seen it since it originally aired like a decade ago. So that was fun. And... I got an unexpected and much appreciated gift (of cash) from my cousin Torry. Anyway, the Ohio kin are all going home tomorrow, and I'll miss them. But it was great to see them this holiday season. ...And then I went home, drank some Stella Artois (which we all know was originally a holiday gift for some town in Belgium, or whatever), and watched Miracle on 34th Street. Oh yeah, also I bought some chocolate peppermint TruMoo yesterday, but didn't get around to trying it until today. I have mixed feelings about it. But I also got around to finally trying my peppermint bark tea tonight, and that was awesome. And I watched a couple of Peanuts specials ("Happy New Year" and "She's a Good Skate"), and Rudolph's Shiny New Year. Spent the last week or so adding more pages to my Winter Holidays section. Also I wrote my new year's resolution on facebook. And I watched The Gift of Winter. I had originally mentioned all these different things on specific dates, but I decided that was unnecessary. I added my final page to the section on January 8. So... I'm late, but it's nice to finally be done for the year. It's Martin Luther King, Jr. Day, and we just took down the tree today. ...Which is kind of early, for this household.